The pulse oximeter probe is clipped onto or taped around a client’s finger, as shown in Figure 4.4. The device displays an oxygen saturation level and a pulse within a few seconds. Palpate the client’s radial pulse (taken for 30 seconds if regular and one minute if irregular) while the oximeter is attached to the finger. 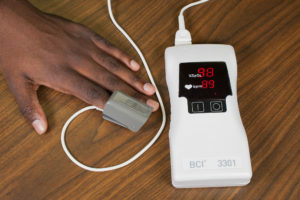 The healthcare provider can have confidence in the accuracy of the measurement of the oxygen saturation level if the pulse displayed on the oximeter coincides with the radial pulse. Nail polish or artificial nails can interact with the absorption of light waves and influence the accuracy of the SpO2 measurement when using a probe clipped on the finger. Remove nail polish or use an alternative method. Many factors can influence accuracy when measuring oxygen saturation levels via pulse oximetry. Certain conditions, including poor circulation and peripheral vasoconstriction, can lead to inaccurate oxygen saturation measurements when the device is attached to a finger or toe. Vasoconstriction involves narrowing of the vessels, so blood flow is reduced to the peripheries. This can reduce the accuracy of the reading and reduce the oximeter’s capacity to detect a signal. Readings may also be inaccurate (low) if a client’s hands or feet are cold or they have poor circulation. In cases like these, use an alternate method of measurement, like clipping a device to the earlobe or taping it to the forehead. The healthcare provider cannot have confidence in measurement accuracy when the radial pulse does not coincide with the pulse displayed on the oximeter. It is also important to note that the pulse oximeter device cannot provide an accurate reading when oxygen saturation is below 75% (Shah & Shelley, 2013). Oxygen saturation levels in the 70s indicate that a client is decompensating and immediate intervention is required. Thus, it is important to confirm accuracy via additional assessments, such as assessing for respiratory distress, drawing arterial blood gases and/or checking for machine error. The significance of the oxygen saturation level is interpreted in the context of the client’s baseline measurements, other data including vital signs and other objective and subjective findings, and the client’s overall health and wellness state. Previous: What are Normal Oxygen Saturation Levels? Oxygen Saturation Technique by Ryerson University is licensed under a Creative Commons Attribution 4.0 International License, except where otherwise noted.